Kiana Sharifi and Alice Lankester of Balderton forged their careers in the Valley. 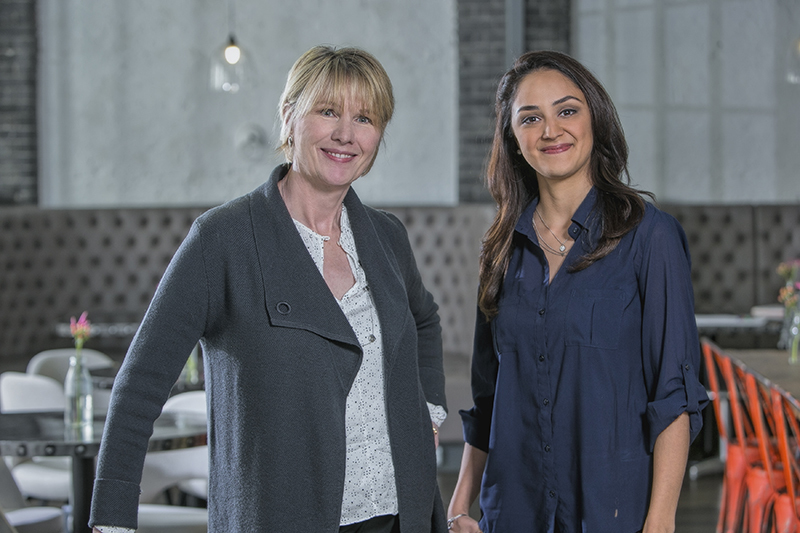 Alice Lankester, head of marketing at Balderton, and Kiana Sharifi, head of talent. Kiana first moved to the Valley to attend UC Berkeley. In her eleven years there, she co-founded two startups and worked with a number of other early-stage companies on marketing and recruiting. Kiana joined Balderton in 2017. I visited London for the first time in 2016. It was an exciting time. There were new early-stage funds emerging, lots of money being raised by promising startups, and everyone seemed to be hiring. There was especially high demand for engineering and product leaders. At the time, I worked at a top executive search firm in Silicon Valley where our focus was hiring engineering and product leaders for venture backed startups. I regularly spoke with executive candidates who expressed frustration with the intense competition and outrageous living costs in the Bay Area. Some would call me a few weeks after our first conversation to let me know they've decided to move out of state. Others would ask me to keep them in mind for positions abroad. On that trip to London in 2016, I saw an opportunity for creating a bridge between the US and Europe, connecting talent across the startup hubs. That was the initial spark. This wasn't about talent scarcity. Europe has excellent universities and companies churning out great talent. This was about the shortage of scale-up experience, the kind of specific leadership expertise that comes from having been through the trial and tribulations of hypergrowth. I could see huge benefits from bringing that kind of know-how into the European ecosystem. Having now spent a year in London advising startups on talent, I can see the many ways in which bringing the Valley mindset and scale up experience into our companies would have a massively positive impact. What I hadn't anticipated was meeting so many people who have made the transition to working in startups in Europe who say it's the best decision they've made. I couldn't agree more. Do you think your US tech experience has given you an ‘edge’ in your tech career in Europe? If so, how? Definitely. The big advantage of working in Silicon Valley is that a lot is happening around you very rapidly. You get to see and experience a ton and you’re always learning, almost by osmosis. So you get good at pattern recognition. You see companies rise and fall every day and you’re close enough to understand why. It’s one thing to hear aphorisms like “innovate or die” or “embrace failure” but it’s a whole other thing to know it in your gut, to have muscle memory of it. That’s what you get from working in the Valley. Because of your experience in the US, do you feel you were, or are, making more of an impact in Europe than a peer without Valley experience? Can you quantify that impact? I wouldn’t say more impact, I think that’s the wrong way of thinking about it. We are all working very hard, contributing to a rising tide of innovation in Europe. I believe I can have a unique impact. My experience in the Valley as a founder, marketer, and recruiter has equipped me with a big toolbox of ideas, anecdotes, and approaches. In my work now, I can draw on those tools to help people think differently and see new solutions to old problems. What has worked out better than you expected in your move to Europe? I knew almost no one when I moved to Europe. Doing what I do, having a strong network is essential so I was concerned about this. I need not have worried. It didn’t take very long for me to build up a network here, partly thanks to Balderton, but also because people are very open and willing to help here. Most people I met for the first time preemptively suggested introducing me to others. Soon I found myself having a different problem, I didn’t have enough time to meet all the great people recommended to me. That’s a good problem to have a few months after moving to a new place. What has not worked out as well as you would have liked? Getting settled into London logistically was not easy. I am no stranger to moving, I’ve lived in ten cities on three continents. But coming from San Francisco to London, it took some adjusting. Things operate slower here, more archaic in some ways. Opening a bank account took two months (though getting a Revolut account only took ten minutes which is great). Figuring out the different rules for the NHS, taxes, signing a lease was laborious. There are resources online but you have to sift through a lot of dated or irrelevant material, find the right bits, and piece it all together. A year later, I still have more questions than answers but I've learned the best source for good information is other expats. Alice has had a 20+ year career in high tech startup marketing in the Valley, and moved back (home) to London in 2015. Her Valley career began as a founding team member at a successful startup backed by Kleiner Perkins and acquired by Symantec. She then went on to leadership positions at a variety of venture-backed startups, including Photobucket (acquired by News Corp) and Loopt (acquired by Green Dot), as well large tech companies including Symantec, Apple and Sun Microsystems. Alice joined Balderton in 2017. I'm originally from London, and after twenty plus years in the Valley, I decided to move back home to Europe. The reason? I had lived the Valley dream, but felt compelled to offer my whole family a chance to experience a new cultural life outside the Valley 'bubble.' While the Valley is an amazing place to live and work, every single person I knew and spent time with worked in tech. My whole family was looking for a new experience. The political, social and cultural changes in the Valley, and across the US, were a motivation and came at a time when we could have a chance to have a real impact on the growing tech startup ecosystem in Europe. All while enjoying the challenge of new cultures with new ways of thinking in Europe. Absolutely. There is a 'gloss' about Valley experience. After being part of many startups, there's quite a bit of 'pattern recognition' that happens in my job now. I can bring hard-won experience to bear in advising our portfolio on how to approach startup marketing challenges. What has worked out better than you expected in your move back to Europe? No question about the answer here: how my family settled into the change. I bought high-school and college-aged children along (plus husband and dogs!) and it's been a universally successful experience for them. The college-age children chose to leave their American universities to join world-class universities in the UK. Even paying overseas rates (even as dual nationals, they have to have lived in the UK for three years to qualify for resident rates of around £9K/year for tuition), higher education is still less expensive. The high-school aged child joined an incredible International school that teaches the American AP curriculum. He has made friends from all over the world, went to Africa for his Junior year charity fundraising trip, is planning his end-of-year Senior trip to Greece, and has enjoyed a rigorous class curriculum as good as, or actually I would say is better than, any he could have received in the Valley. Plus, he gets to experience the incredible freedom of an Oyster card to travel all over London at weekends to see friends. Honestly, nothing. I had the advantage of being 'from' here originally, and already had a footprint in terms of friends, housing, banking, and so forth. That made our transition significantly easier than someone coming here with no prior experience of the region. What advice would you give someone considering making the same move to Europe? This is easy to answer because I am giving this advice regularly to friends and former colleagues who are considering making, or have made, the move. If you have family and housing ties, take a 'phased' approach. If you can, set up a six-month advance beachhead for housing, job, and all the ancillary services like doctors and dentists before the rest of the family arrive. If you can, experiment with different locations to live, and keep your possessions footprint light, to find a neighbourhood that suits you and your family team. Come over for in-person networking forays. Flights are (relatively) cheap in the January/February/March period — so that's a good time — plus you get to see Europe at its dark post-Winter worst! Meeting people face-to-face is incredibly important. As my colleague Kiana said, people are very willing to help. Finally, be brave! Nothing needs to be forever. If you need to, think about the move as a 'sabbatical,' where you get a chance to share the valuable experience you have learned, while learning new things yourself. If you return to the States, you'll bring with you a fresh perspective and understanding that will be invaluable in your career.